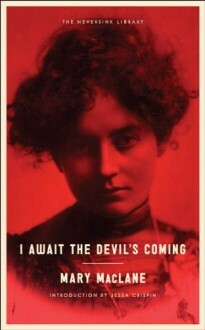 Mary MacLane’s I Await the Devil’s Coming is a shocking, brave and intellectually challenging diary of a 19-year-old girl living in Butte, Montana in 1902. Written in potent, raw prose that propelled the author to celebrity upon publication, the book has become almost completely forgotten.In the early 20th century, MacLane’s name was synonymous with sexuality; she is widely hailed as being one of the earliest American feminist authors, and critics at the time praised her work for its daringly open and confessional style. In its first month of publication, the book sold 100,000 copies — a remarkable number for a debut author, and one that illustrates MacLane’s broad appeal.Now, with a new foreward written by critic Jessa Crispin, I Await The Devil’s Coming stands poised to renew its reputation as one of America’s earliest and most powerful accounts of feminist thought and creativity. This was a very strange little book. While I found most of it to consist of over-the-top teenage angst, there were a few gems to be found.